Massachusetts Oyster Project: An Overview of the Demise of Rhode Island's Oyster Industry and its Cause... The Toilet??? An Overview of the Demise of Rhode Island's Oyster Industry and its Cause... The Toilet??? We recently came across this terrific and insightful presentation by Michael Rice of the Rhode Island SeaGrant. The economic overview is very thought provoking. In 1910 oyster protein cost 1/3 of that of eggs. while today it is roughly 6 times as costly. What drove this change? Well one interesting factor appears to be the dramatic decrease in supply. In 1910 Rhode Island had 21,000 acres of oyster farms. (No we are not off by a zero.) The hardy creatures could be shipped without refrigeration and the industry threw off the modern day equivalent of half a billion dollars into the State's economy. Today RI's oyster aquaculture is down to 172 acres. In 2012 direct oyster sales were under $3 million and the economic impact was less than $15 million. This means there is a huge economic opportunity here. But what drove the fall off in oyster production? This is where it gets really interesting. 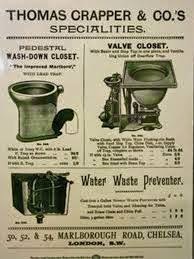 In 1901 John Crapper began promoting the siphon toilet that was actually invented by John Harrington. With the influx of indoor plumbing driven and the growing use of toilets, the amount of liquid waste grew dramatically. This in turn led to the expansion of the sewer systems in the 1910-20 period, which led to increased waste disposal in the Narragansett Bay. While this solved the sanitation problem in the cities, it led to problems with oyster safety. The deaths of several prominent people drove the development of the National Shellfish Sanitation program in 1925. With pollution already taking its toll on the available area, the Hurricane of 1938 hit many hard and then came the labor shortages of World War 2. These labor shortages were significant. The trees we see along many golf courses today began growing in as there was less manpower to tend the courses and they focused on the actual holes. The last oyster farm closed in 1952 and the field did not restart until 1995. Map of Narragansett Bay and its Catchment Area. Here is Dr. Rice's terrific presentation.